About two or three times a year I empty out my wardrobe from top to bottom and have a good old clear out. Usually when the seasons are changing, I find I need to update my clothes and add my winter or summer clothes onto my hangers. Recently it's been getting to the point where if I add a newly ironed shirt into my wardrobe, it'll most likely be creased to no end by the morning! Drastic action needed to be taken. 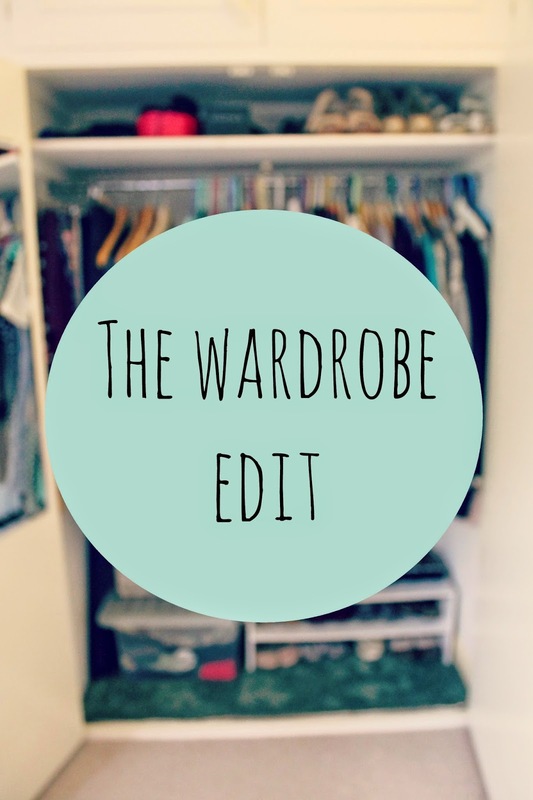 I'll take you through how I edit my wardrobe and get everything in an organised state! Before I get into the steps, I'll talk about my inspiration. I bought the Lauren Conrad 'Style' book about two years ago and it's such a handy book for sorting out your clothes, packing for holidays and generally just getting your wardrobe back into shape! I'll also look on Pinterest and Youtube for posts about how people sort out their clothes. I found the Vivianna Does Make Up video on organising your wardrobe particularly helpful! First thing first, I'll get all my clothes out of my wardrobe and separate them into jumpers, jeans, dresses etc. so it makes it easier when putting them back in order. I'd recommend trying on all your clothes, that way you'll know what fits, what doesn't and if anything is stained or ripped. It's a long task, but stick on Friends or a good girlie film and you're set for a few hours! Keep - this is the stuff that you know you'll wear again and will never get rid of. Maybe - clothes that you wear occasionally and still love. Sometimes you find some gems that you forgot about! In the Lauren Conrad book, she recommends storing it in a bag then coming back to it in a few months time and see if you still need it. Charity - items which are a little old and you don't wear anymore, but are still in good condition. Friends and Family - if there's ever an item of clothing I know my friend or family member loves and has been eyeing up for a while, I'll put it to the side for them. Throw - anything ripped, stained or looking very worn and loved. Now your wardrobe is empty, give it a good scrub and clean! If you're anything like me, they'll be a few cobwebs hanging about and dirt on the floor. I also swapped around my foot shelf and tried arranging my clothes in a different way to shake things up a bit and keep it feeling refreshed. Finally, add all your Keep clothes back in!! This is where my supremely organised skills come in. The top two shelves are tops, third shelf plain tops and bottom shelf is jumpers, with an overflow at the very top! From Left to Right, I have my scarfs, comfy clothes like hoodies and jogging trousers and then my coats. Varying from Denim, Green, Brown to Black, there's not a lot of colour in my coasts! But it's good to finally be able to see them. Shoes are just thrown in any order, with my running shoes at the very front with sheep de-odour's in them! My main section is organised in this order: Skirts, Trousers, Jeans, Dresses, Shirts and Jumpers and Cardigans. It's a system that works for me, because I can just pick out a dress or shirt and trouser combo easily, without having to search through the sea of clothes. You may have noticed I have them in a slight colour order too, just another highly organised tip! I also have a box of thick winter scarves, hats and jumpers that I'll get out later in the year, with my camera and tripod next to them. What's your top wardrobe organising tip? Do you love or hate editing your clothes? The Blog Your Heart Out Tag!